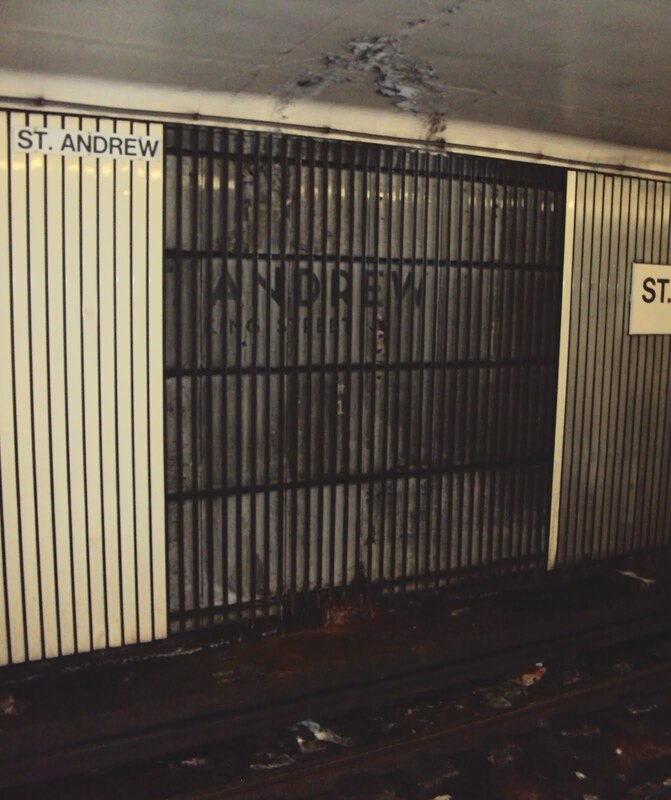 What it is is a relic of the original interior of St. Andrew Station. While I knew many of the subway stations on the Yonge and University lines had been redone, I decided to find out more. The University line opened in 1963. 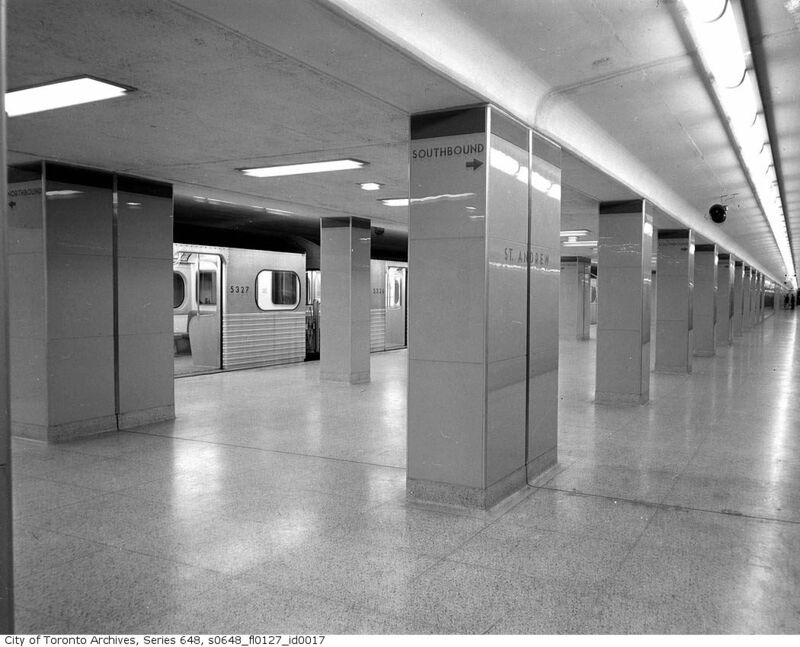 Vitrolite tiles were used in the first two stations constructed–Osgoode and St. Andrew–as they had been used on the Yonge line. St. Andrew featured grey tiles with either black or dark blue banding and lettering. However, the Vitrolite was not the sturdiest of materials and it was replaced in the early 70s with the metal banding that can be seen in both stations today. It’s quite clear from my photo (and others I’ve seen) that the tile was simply covered up rather than removed. You can also see some of the water damage that seems to have been instrumental in shortening the life of the Vitrolite. An interesting tidbit I found out is that only one TTC station retains its original Vitrolite: Eglinton Station. (The Bloor line stations never used it.) I remember many years ago wondering why the tile in that station looked so much different than any other station. I just may take a lunchtime TTC field trip in the next few days to see it–as well as to take some more St. Andrew photos–because renovations are in progress at the station, allowing the potential viewing of three layers of subway interiors all in one station. The new tiling is evocative of the old Vitrolite, but is definitely not Vitrolite (as one of the reasons why the tile was covered over in the first place is that it stopped being manufactured in North America). If all goes well, I should shortly have some additional photos to post on St. Andrew and Eglinton stations.